“You” means the person who signs the booking form. Your period of hire gives you an exclusive right to the use of those hall facilities that you have booked. You are responsible for your personal security and we would advise you to close (but not lock) the front entrance once all your party has arrived. A security deposit of £50 may be required at the time of invoicing for the hire of the Hall, both the deposit and the hire charge will be made at the same time. The Hall reserves the right to apply a charge, or deduct a sum from the security deposit, to cover the cost of additional cleaning required as a result of non-compliance with the Terms and Conditions of hire. Cancellations made within four weeks of the hire date may, at The Hall’s discretion, be charged for. Non seated events 140 people. On the day of hire, an access key fob will be provided or the Hall will be open. You are responsible for the Hall from the time the key fob is collected, or the booking period commences, until the key fob is returned, or the booking period ends. Please ensure that all doors and windows are locked when you leave. If a key fob is issued then a charge of £200 will be made if the key fob is not returned (to cover the cost of replacement). For evacuation purposes, please ensure that during the hire period all furniture or other obstacles are not placed within two metres of the fire exits and that “easy access” is maintained to all exits. Birlingham Village Hall does not accept any responsibility for loss or damage to the property belonging to the hirer, their party or for any items or equipment not specifically provided by The Hall. The Hirer is responsible for the safety of electrical equipment you or any outside agencies (e.g. caterers, party/operators etc.) used on the premises and for ensuring it is used safely. The Hirer is also responsible for ensuring that such equipment is in good condition and complies with current UK electrical regulations. The Hirer is responsible for informing The Hall in advance if such equipment will be used. Please wash up everything you have used and replaced as appropriate leaving the kitchen clean and tidy. the behaviour of all persons using the premises, whatever their capacity, including supervision of all car parking arrangements to minimise nuisance to neighbours or obstruction of the highway. The Hirer shall make good or pay for all damage/loss to the premises, land, the fixtures & fittings or contents. For children’s parties you must ensure that there is at least one adult in attendance throughout the party for every 10 children present. Please do not use any form of sellotape, masking tape, blu/white tack or drawing pins to secure decorations to the walls, supports, doors and/or frames. To avoid damage to the floor, do not drag the tables or chairs or any other form of appliance or equipment or allow the surface to be scratched or abraded. The Hirer is responsible for any damage caused by breach of this condition. Make sure the hall clean and tidy. The Hall reserves the right to charge for any extra cleaning deemed necessary. You must return to the proper places all equipment used. In particular: tables returned to storage area (there is a photograph in the storeroom showing the layout), chairs stacked as found, floors swept, toilets and kitchen left clean, dustbin bags and recyclable rubbish placed in black and green bins respectively. These bins are on the patio area outside the hall and adjacent to the kitchen. Please check that all lights are turned off, any electrical equipment belonging to The Hall and used by the hirer is left in a safe condition. Ensure that The Hall is properly locked and secured (unless directed otherwise by The Hall). The Hirer is responsible for ensuring the premises are vacated in a quiet and orderly fashion and that all persons have safely vacated the building. If the Hall is hired in the evening sufficient time must be allowed for clearing up, so that the premises are vacated by the end of the Hall’s operating hours. Otherwise additional time must be booked on the following day. If in any doubt please discuss your specific requirements prior to securing the booking. Use of the Hall is subject to the Premises Licensing Conditions issued by Wychavon District Council which details the activities and times that specific activities may be carried out. 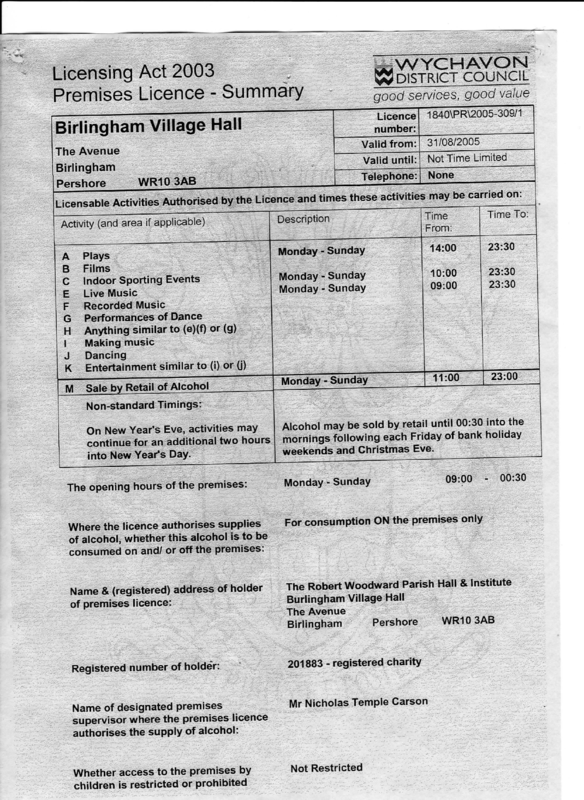 A copy of the Licence is displayed on the internal notice board of the Hall and also on this website (premises licence). The Hirer shall be responsible for reading and complying with the terms and conditions of the licence in all respects. The Hirer is responsible for observing all other regulations appertaining to the premises stipulated by the Fire Authority, the Local Authority, and the Local Magistrates’ Court or otherwise. You shall indemnify The Hall for any costs arising from any breach of the above. You may not sell tickets for admission without The Hall’s written consent. The Hirer shall ensure compliance with the prohibition of smoking in public places provisions of the Health Act 2006 and regulations made thereunder. Any person who breaches this provision shall be asked to leave the Hall. The Hall is licensed for the sale of alcohol. Be aware that the Hall has a challenge 25 policy and it is the responsibility of the hirer to enforce this requirement and obtain proof of age from any person who looks under the age of 25 years old. Village Hall events organised and run by the management committee will be covered by the Hall’s licence. However, it is at the discretion of the management committee if other hirers of the hall can avail themselves of this facility. You must ensure you have indicated to the management committee that you require this facility and receive confirmation of acceptance. Otherwise you will be required to obtain a licence under the Temporary Event Notice system. Should you wish to sell your own alcohol you will be required to obtain a TEN from Wychavon regulatory services. These currently cost £21.00. You can apply by post by contacting. You can apply and pay online via GOV.UK and this is the fastest way for WRS to receive and process your application. The Hirer shall indemnify the Trustees for the cost of repairs to any damage occurring to any part of the property, including the contents of the building, which may occur during the period of hire or as a result of the hire. The Hirer shall be responsible for the supervision of the premises, the fabric and contents, their care, safety from damage. The Hall reserves the right to charge for the repair costs. The Hirer is responsible for the behaviour of all persons during the hire period. The Hirer shall not use the premises for any unlawful purpose or in any unlawful way. that the challenge 25 policy is adhered to. In the event of a complaint concerning the hire of the village hall the Hirer shall notify The Hall of the nature of that complaint in writing within seven days of the hire start date. The Hall cannot accept responsibility for any loss or damage to property and personal belonging to the Hirer, or their party.